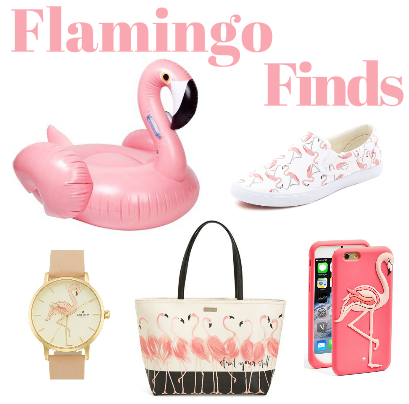 Have you been seeing all the flamingo inspired items out there? I'm not exactly sure why it's becoming such a trend right now, but I'm definitely enjoying it! Here are a few of my favorite flamingo finds! I have a pool at my new condo, and if I had a place to keep this Flamingo floatie I would snag it right now. It's huge and would be a great way to lounge around in the pool! The tote is a perfect size for heading out to the beach this summer or just walking around town. The black and white add a classic twist to the flamingo trend, so if you're looking for a fun pattern that will remain in style, this is it! The Kate Spade watch is something that caught my eye when I was shopping on their website. I love the simplicity of it, and can see myself wearing it with a variety of different outfits. As a big fan of easy to put on shoes, I'm so happy I found these slip on sneakers! I used to wear the vans version of this style shoe all the time years ago, so I already know how comfortable they are going to be. (Check out my favorite slip on shoes ever here.) However, despite how cute and trendy all these other flamingo items are, the phone case is my absolute favorite!! I saw it while with my sister the other day and almost picked it up right then and there. The only thing that stopped me was the fact that I had no money in my wallet. By the way, it's only $35! I've attached a few other flamingo options below! Have you found anything else flamingo inspired? Share in the comments!